Every woman knows that the way to a man’s heart is through his stomach. So, to make a good stuff, with sticking it to the cooking utensils, Indian women’s choose non-sticking cookware for cooking delicious food. 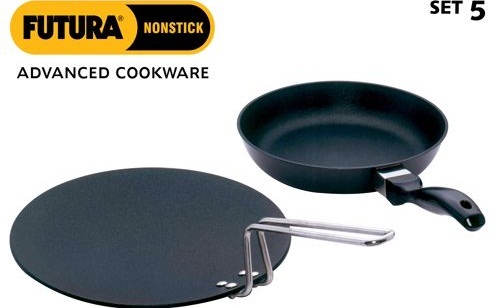 A non-stick base is base designed in such a way that the ability of other material to stick to it is reduced. The common application of non-stick cookware is that it allows the food to turn brown without getting stuck to the pan. Non-stick pan often comes with the “Teflon” coated surface. Now in 21st century, there are many other coatings which have been introduced. Such as, ceramics, seasoned cookware, silicone etc. 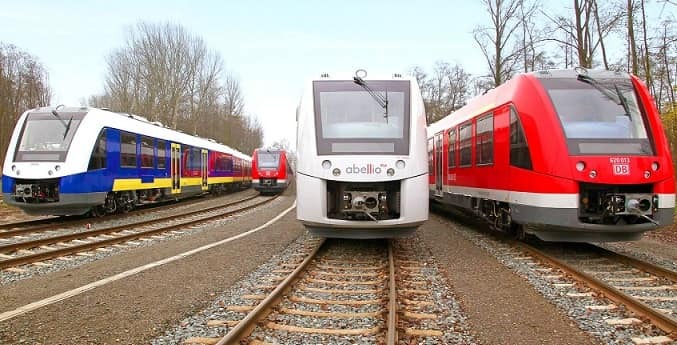 It is an ISO 9001:2000 certified company since 1971. They gave a start with the manufacturing of gas lighters which tend to achieve great success. Soon after they gave a start to the non-stick cookware business in the year 2007. Wonderchef is a brand by Chef SanjeevKapoor. They include Dosa Tawa, Sauce Pans, Grill Pans, Pressure Cookers, Kadhai and many other Pans. 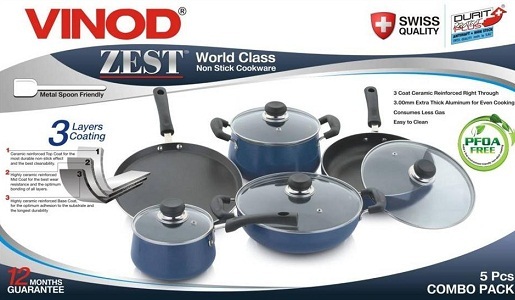 The products for this brand are Self hand-picked by Sanjeev Kapoor from the world’s best companies, which are greatly known for their high quality non-stick cookware range. The brand ‘Wonderchef’ is slowly becoming the popular cookware brand in Indian countries. Kitchenware India is known to be a flagship brand of Hi-tech Engineering. Their portfolio manufactures high quality of stainless steel cookware, utensils and other kitchen accessories. They are sold at very reasonable price. 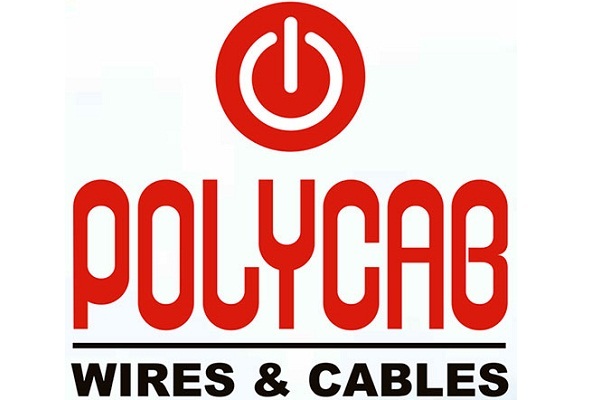 It has become the leading manufactures just within 20 years, as it was established in the year 1996. 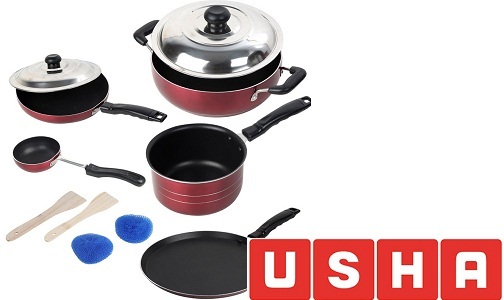 Usha is a very reputed name of cookware and utensils supplied all over India. It has three brands of cookware- Eurolex, Eurocook and Lexilite. 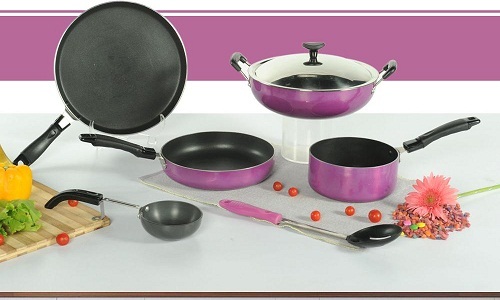 High standards cookwares are manufacture by them. The cookware comes with long lasting hard bottom. Their best sellers are their stainless steel cookers and non stickkadhai. 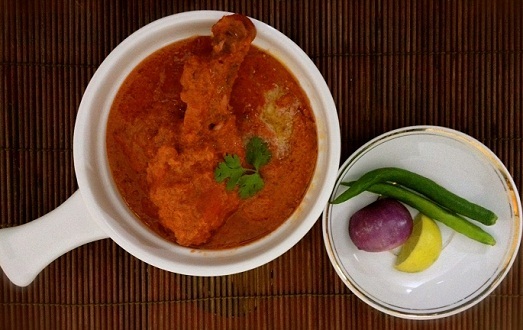 The brand Pigeon in the Indian kitchen is a household name. It is a primary brand of ISO certified “StovekraftPvt. Ltd.”. 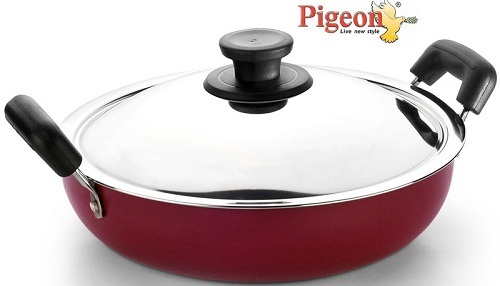 It has stainless steel cookware range and non-tick cookware range. It is available in both round and flat base. It has many retailers and distributors all over the country with their cookware available in all leading cookware stores. 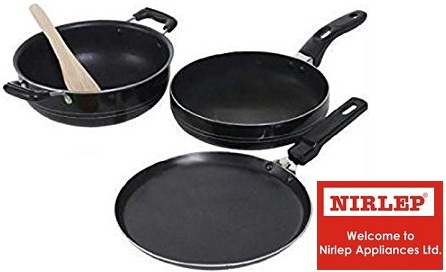 This brand produces the best and high quality non- stick & stainless cookware such as Tawa, Saucepans, Pressure cooker, kadhai, Milk pans and many more. 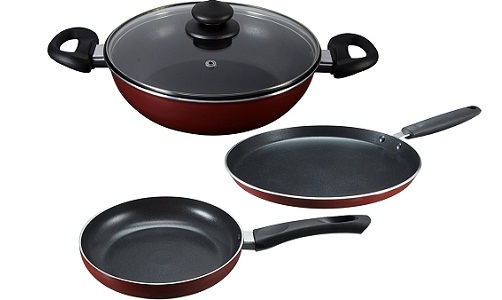 This brand’s non-stick cookware come with 3 layers of non-stick on anodized base, with its shelf life 60%. 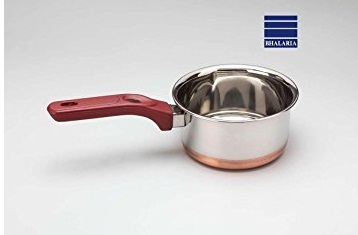 Since 175 years Bhalaria is manufacturing stainless steel products. Being the most trusted brand of stainless steel cookware and kitchenware products they have widest range of stainless steel cookware and kitchenware products. All the products are made up of best quality steel and best designs. Their base is available in both flat and round bottom so that it could suit both LPG gas stove and induction plate. In the year 1963 it got established, and by now vinod cookware have grabbed the trust in the Indian kitchens. “Aluminum Sandwich Bottom” cookware was first introduced by vinod, which became the most reasonable cookware alternative to copper cookware. Their band is available at all leading markets in the country with pressure cookers, non-stick cookware, stainless steel cookware, hand anodized range of cookware. The cookware of this brand is also exported to neighbouring countries. Without any doubt “Prestige” brand of cookware stands at No. 1 position this year. 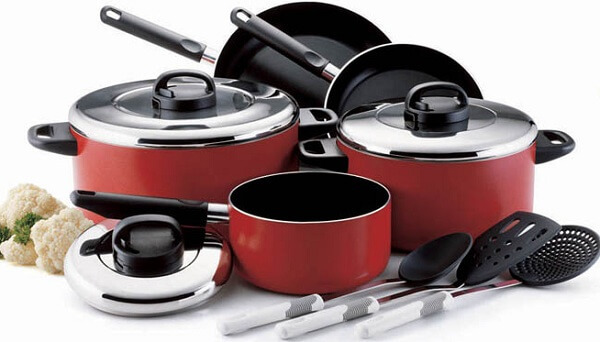 Prestige is a primary or say a chief brand of cookware from “TTK Prestige Limited”. Prestige cookwares are the most successfully running cookware in Indian market used by millions and millions of Indians. 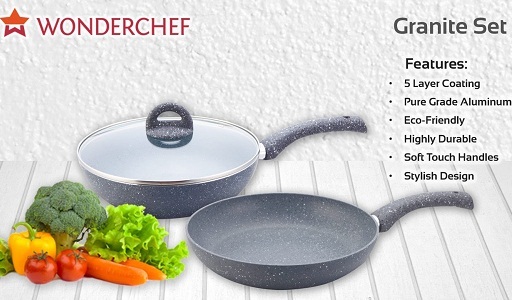 All the cookware of this brand is designed with either non-stick surface or are stainless-steel which are made up of high quality material and are properly tested for durability and safety. This brand’s best selling cookware are their Pan, Tawa, and Pressure cookers. So, these above listing from 10 to top 1 are for best cookware in India. The cookware brands are given their position according to their popularity and Indian kitchen’s belief on the specific brand. All the brands listed above consists of proper information regarding, which materials are used in the makingand designing the cookware such as pressure cookers,pan, tawa, kadhai, sauce pan, stewpot etc. It is also known that whether the cookwares are made up of high quality steel, high quality plastic, or of high quality rosewood. We also got to know that whether it may non-stick surface or stainless steel surface the durability and safety are tested properly. The top listed brands have grabbed the Indian market to a great extent. And as far as the brands popularity is considered these brands cookware are also supplied to foreign countries.